First known picture of SCP-054-FR. Special Containment Procedures: A exclusion zone of 1km has been established around all shorelines where an occurrence of SCP-054-FR has been observed. Only personnel with a Clearance Level of 3 or higher may enter the containment zones, and only for experimental purposes. Access is forbidden to any and all civilians under the pretext of conducting research on a population of marine mammals (depending on the place). A-Class (for witnesses) and/or B-Class amnestics (for victims) are to be administered where necessary. Photos and videos taken of SCP-054-FR must be destroyed, and an extensive campaign debunking them as hoaxes must be launched should any evidence be made public. Description: SCP-054-FR is a phenomenon occurring in some waves off the western coasts of ████████ and █████, and the Eastern coasts of ████, ██████ and ██████. It is characterized by the physical transformation of affected waves to resemble the jaws of a Carcharodon carcharias, commonly known as a Great White Shark. SCP-054-FR is capable of remaining unnoticed until it is almost too late to act. SCP-054-FR is capable of forming on waves at least 4m tall, but the maximum height of which it can reach is unknown. Affected waves are capable of rolling at 3 times the speed of non-affected waves if a non-aquatic animal or a human being is situated between SCP-054-FR and the closest coast. Appearances of SCP-054-FR grow considerably if the previously evoked individuals are situated at a distance of at least 250m from the coast, whether they are swimmers, divers, or aquatic vehicles of moderate size, with the most common victims having been surfers. Injuries caused by SCP-054-FR are similar to that which could be accomplished by a Great White Shark, but with pressure being directly proportional to the height of the affected wave. Injuries, lethal in 68% of cases, occur during the collapse of the wave over the victim. Reported injuries have been as simple as a removed limb to total disappearance of the victim. 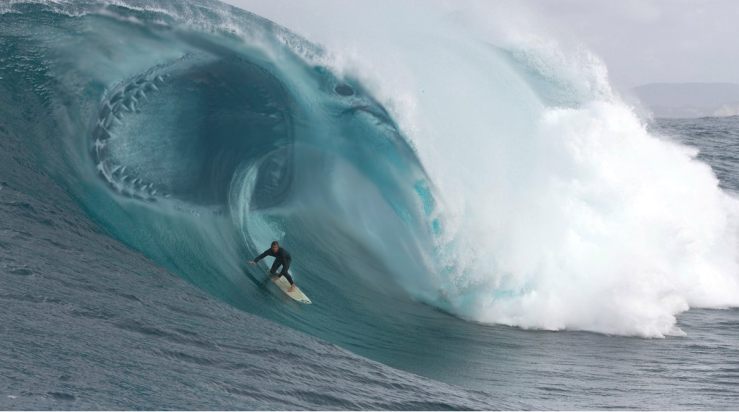 The only method of avoiding injury by SCP-054-FR is to dive under the wave before impact. SCP-054-FR appears only on the part of the wave to closest its victim. If more than one victim is available, SCP-054-FR will manifest at multiple points on the wave. SCP-054-FR will accelerate to an average of ███kph, with the highest reported speed being ███kph. Addendum 054-A: A series of experiments discovered that releasing several litres of animal blood in the waters where SCP-054-FR is known to occur can cause its manifestation within two minutes. The instances of SCP-054-FR collapsed over the released blood. Further testing involving an equal amount human blood yielded a response in less than 60 seconds. Even small amounts of human blood have yielded faster reaction times than large quantities of animal blood. Addendum 054-B: Unusually, several maritime birds were observed be consumed by SCP-054-FR when they moved in front of a wave taller than 4m. This was the first time SCP-054-FR has been observed attacking anything other than human prey. Addendum 054-C: Observations have shown that wounded peoples are 4 times as likely to be victims of SCP-054-FR, with an instance manifesting in less than 60 seconds. Further testing revealed that remaining motionless reduced the likelihood of SCP-054-FR manifestations, as did slower body movements. Addendum 054-D: All the attempts at damaging manifestations of SCP-054-FR via weapons fire have proven ineffective, with shots disappearing into the wall of water. Furthermore, attempts at concealing the subjects' smell have proven equally ineffective, with SCP-054-FR not appearing to be affected at all.